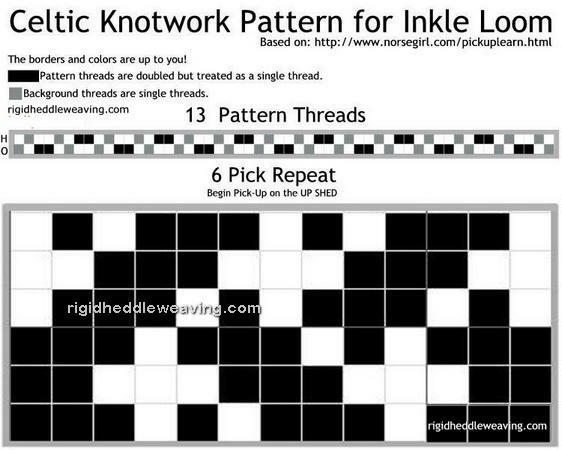 This method works for ANY loom, not just an "inkle loom"! According to Mary Atwater's booklet on Inkle Weaving (found here) this is the "European Method" of warping. It's also called "Baltic Threading". There are 2 background threads alternating and a pattern thread (doubled--but treated as one thread) between the background threads. When using a rigid heddle frame, just use the shed blocks on your frame as usual. If the rigid heddle is small and hanging in neutral (as with backstrap or inkle loom), use a shed stick to keep the sheds open. If weaving this with an "inkle loom", again, use a shed stick to keep the sheds open. When warped correctly (7 of the pattern threads will be in the up position), the pick up patterning begins on the UP SHED. For inkle loom, O=OPEN position (up shed) and H=HEDDLED position (down shed). For Rigid Heddle, O=HOLE and H=SLOT. For other looms, O=Shed 1 and H=Shed 2. Here's my video tutorial showing you how to weave this with a rigid heddle. Can you post a photo of the finished woven pattern? This article is from 2014 and I no longer have any bands with this pattern on them. I'm sure a Google image search would bring up a lot of examples of this. Thank you. This was so clear.